The fire that broke out at Wahed Mansion at Churihatta of Chawkbazar spread fast as chemicals were stored in the building, said a probe body of Dhaka South City Corporation (DSCC) formed over the devastating fire that claimed 78 lives. 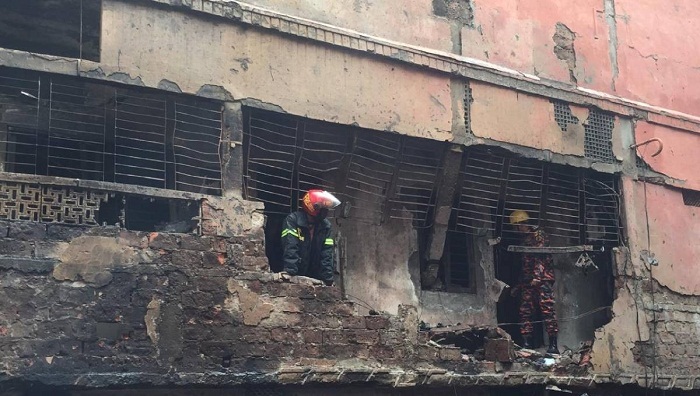 “There must have been a chemical warehouse inside the building and there was no fire extinguishing system either,” Lt Col SM Julfiker Rahman, a member of the probe body, told reporters after visiting ‘Haji Wahed Mansion’. “The powder found here was of chemical substance…the plastic bottles were full of chemicals,” said SM Julfiker, also the director of Fire Service and Civil Defence. The probe body also includes Dhaka South City Corporation (DSCC) Chief Engineer Md Rezaul Karim, Prof Dr Mehedi Ahmed Ansdari of Bangladesh University and Engineering & Technology, DSCC Urban Planning Expert Md Sirajul Islam, Rajuk Supervisor Engineer Md Nurul Islam, Director Md Shah Alam.